MONTRÃAL, Aug. 1, 2018 /CNW Telbec/ – BTB Real Estate Investment Trust (TSX: BTB.UN) (“BTB” or the “Trust“) is pleased to announce the acquisition of a retail power center known as the “MÃ©ga Centre Rive-Sud” in LÃ©vis, QuÃ©bec. This $42.6 million transaction, excluding transaction fees, brings to 72 the number of properties owned by the Trust. This acquisition is in line with the conclusions of BTB’s strategic review, selling its smaller properties or its properties located in smaller markets, while purchasing larger properties or properties located in larger markets in the provinces of Quebec and Ontario to maximize the Trust’s financial performance. 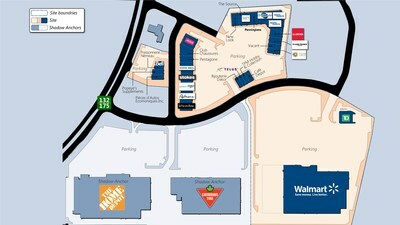 This retail power centre has an approximate total leasable area of 205,000 square feet and it is anchored by Wal-Mart. It is located near Carrefour Saint-Romuald, a property recently purchased by BTB, and two shadow anchored retailers; Canadian Tire and Home Depot. BTB is a real estate investment trust listed on the Toronto Stock Exchange. BTB is an important owner of properties in eastern Canada. Today, BTB owns 72 retail, office and industrial properties for a total leasable area to date of more than 5.6 million square feet. The objectives of BTB are: i) to grow its revenues from its assets to increase distributable income and therefore fund distributions; (ii) to maximize the value of its assets through dynamic management of its properties in order to sustain the long-term value of its units; and (iii) to generate cash distributions that are fiscally beneficial to unitholders.